exceptionally gifted talents, Jackson broadened minds across the globe. He expressed creativity through the performing arts, where he also carried on the civil rights legacy of those many African Americans, musicians and others, who paved the way for him( photo credit: talkradionews). He emerged out of, and was a product of, the civil rights movement and reinforced some of its most important themes, which gives his music more power. Throughout his career he challenged white racism, deeply embedded racist and gendered stereotypes, and social inequality. By doing so, he helped to shift the course of U.S. racial history. Because of Michael Jackson and others like him, today we have Barack Obama as our U.S. President. Prior to Jackson’s entrance into the music scene, it was largely segregated by genre, social scenes, and groupings. During the disco backlash at the turn of the 80’s, Jackson’s innovative Off the Wall remained strong, though it wouldn’t be until the release of Thriller that he would become an overnight sensation. The racist and gendered socio-psychological barriers of U.S. society were shaken, and social (popular culture) changes were set in motion nearly overnight. Jackson’s rise to stardom came when radio waves had recently switched over from AM to FM, and the few radio stations were not equipped to make way for the range of innovative sounds generated by this new pop artist. Jackson’s music was not reserved for a single genre, sound, or audience. Over the next decades, Jackson’s music went beyond radio and television, and entertainment facilities. It was played at weddings and other milestone events. Even as instrumental music, his tunes were in restaurants and other public spaces. He was listened to by young and old as he cut through generational boundaries; by black and white, and many others; by non-professional and professional; by national and international. Considering racism, patriarchy, and masculinity, he managed to transcend both race and gender in ways that no other artist has done. Messages channeled through his work spoke to all people. With a combination of work done previously by Dr. Martin Luther King, Jr., and many civil right activists and of advanced technology, together with his being a gifted entertainer, Jackson was able to touch people worldwide and promoted changes associated with bringing forth social equality globally. To a significant degree, the inclusive message and approach President Obama used for his presidential campaigning was in line with the orientation of Michael Jackson and of Dr. King. Like Jackson and King, President Obama was speaking to all people, calling for social change, and encouraging all people to step forward, honor the liberty and justice creed, and do what they could to make this world better. The difference between these three very important figures is that they were working from different societal angles: Jackson was channeling his message as a musical artist through popular culture; Dr. King as a minister working within the realm of Jim Crow segregation and on front lines with activists; and President Obama working within the political sphere competing for the presidency that might allow him to incorporate significant changes through his governmental position. One crucial difference between the three, however, is that Jackson and King addressed racism much more directly and suffered many negative consequences as a result–such as damage to their psychological and physical wellbeing, and perhaps in the final years for Jackson’s own self and identity, and a premature life for both. While this society has taken a tremendous step forward in voting in the first president who looks like much of the global population, it is still much too racist in framing and practice for President Obama to address numerous major racial issues firsthand as was done by Jackson and King. Nonetheless, President Obama’s more subtle antiracist messages are now being communicated quietly through his actions and decision making. Many of the new faces that participated in this last Presidential election and voted for Barack Obama were exposed to the influence of Michael Jackson in some way or another during their lifetimes. Had there never have been Michael Jackson in the decades prior, what would have been the possibility that President Obama could have come forth and won the presidency? Without Jackson’s profound antiracist influence on popular culture and society? Had there been no Michael Jackson and people like him, one could presume that the racism would have remained the way it was prior to 1960 where, despite its strides toward desegregation, society, including music, would have remained largely segregated. It would be a great overstatement to suggest Michael Jackson alone brought civil rights changes, but it is fair to suggest that his influence and positive messages touched people of different generations, as well as members of all racial and ethnic groups, and impacted the collective psyche of people so as to help in getting a black Presidential candidate elected. Whether people are conscious of it or not, more people participate in popular culture than politics. President Obama, like Jackson and King, had a way of appealing to, and including, people of all backgrounds. If there were no Michael Jackson and those civil rights activists prior to him, no antiracist inclinations among the general population would have been well established—particularly among the younger nonblack voting participants in this last presidential election. Likely, the racist fear tactics generated by the media and contending parties would have quickly crashed Senator Obama’s campaign. Most certainly, without the prior exposure and conditioning of Michael Jackson’s music at the collective level that cut across different generations, Obama’s vision of “hope” and “change” undoubtedly would have been less contagious. Without Jackson there would be even more psychological segregation between peoples than we have. It’s a combination of groups that voted for President Obama that allowed him to succeed. He won the African American, Latino, Asian American, and Native American groups by large margins–and even a bare majority of the youngest white people, many of the latter also influenced by Michael Jackson. As Jackson changed over the years, and became the center of controversies yet to fully unravel, there is no question his fans became saddened, confused, and concerned of what was becoming of their liberating icon. His sister, Janet Jackson, along with her gifted musical talents helped bring balance to her brother’s trials and difficulties associated with fame. The strength she has shown over the years allowed his/their fans to preserve their respect for important contributions both Jacksons made to popular culture. 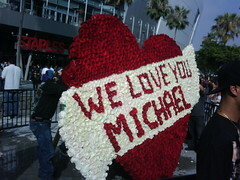 We have Michael Jackson to thank for much. Music, protest music and spirituals, were the heart and soul of the civil rights movement, and Jackson’s music continued that long tradition. We all have to thank him for his never ending commitment to social equality. We have to value the courage he showed in directly challenging racist and gendered structures, especially in the music and recording industries, and in using his talents in positive ways that helped bring forth significant societal, even global, changes in popular culture and beyond. And Michael Jackson needs to be credited for the contributions he made to popular culture and society over decades that served to help make Barack Obama President of the United States. Thanks MJ, RIP.